STYLE : If you simply need an elevated surface to keep notes while speaking before a small audience, perhaps a tabletop lectern is the answer. They can sit on existing furniture and are lightweight, portable and inexpensive. A better way for a speaker to draw the audience’s attention is to have a full-length lectern. These full-length lecterns come in a variety of designs and materials. In a small space, such as a classroom, a speaker stand with a simple base will be effective without using up too much floor space. A clear acrylic lectern is also a great solution for a small space or area that should have an unobstructed view. For larger audiences, full-bodied lecterns will give more presence to a presenter and may act as a comforting barrier that can lessen stage fright. These lecterns come in a variety of wood finishes that will make any presentation look polished and professional. Will the lectern be moved frequently? Look for lecterns or podiums that come with casters for ease of mobility. Adjustable height lecterns are also available for spaces that have speakers of all ages and sizes. Giving a presentation soon? While you may have to do extensive reseach for your presentation details, look no further for the right lectern to stand behind. Worthington Direct has a wide variety of lecterns, podiums and multi-media carts that will ensure your presentation looks polished and well thought out. This is the last week for free shipping on the Orator lecterns by Oklahoma Sound, so don’t delay! Know the needs of your audience and match your contents to their needs. Know your material thoroughly. Put what you have to say in a logical sequence. Ensure your speech will be captivating to your audience as well as worth their time and attention. Practice and rehearse your speech at home or where you can be at ease and comfortable, in front of a mirror, your family, friends or colleagues. Use a tape-recorder and listen to yourself. Videotape your presentation and analyze it. Know what your strong and weak points are. Emphasize your strong points during your presentation. When you are presenting in front of an audience, you are performing as an actor is on stage. How you are being perceived is very important. Dress appropriately for the occasion. Be solemn if your topic is serious. Present the desired image to your audience. Look pleasant, enthusiastic, confident, proud, but not arrogant. Remain calm. Appear relaxed, even if you feel nervous. Speak slowly, enunciate clearly, and show appropriate emotion and feeling relating to your topic. Establish rapport with your audience. Speak to the person farthest away from you to ensure your voice is loud enough to project to the back of the room. Vary the tone of your voice and dramatize if necessary. If a microphone is available, adjust and adapt your voice accordingly. Speak with conviction as if you really believe in what you are saying. Persuade your audience effectively. The material you present orally should have the same ingredients as that which are required for a written research paper, i.e. a logical progression from INTRODUCTION (Thesis statement) to BODY (strong supporting arguments, accurate and up-to-date information) to CONCLUSION (re-state thesis, summary, and logical conclusion). Do not read from notes for any extended length of time although it is quite acceptable to glance at your notes infrequently. Worthington Direct can supply your school with a variety of furniture designed to enhance communication and collaborative learning in the classroom. Lecterns are great tools for students to practice public speaking in front of small or large groups. Choose from a basic Table Top Lectern to a full size Floor Lectern with Sound. 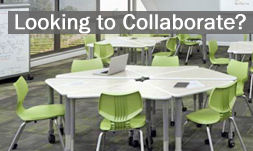 Worthington Direct also has many different student desks that can be used to form collaborative work spaces that develop team building skills. Visit today, www.worthingtondirect.com. Between tasks in Algebra 2,Valari Jacobsen checks her grades in the class. Accessing her personal page on the school’s computer system, she sees she has a 71 percent in course content. She knows she needs to step that up. But she’s doing really well in collaborating with her peers: Her score is 100 percent. And in oral communication, she has a 135 percent. Unusual as it may seem, Jacobsen, an 18-year-old senior, is being evaluated on oral communication and on how well she works with other students in her mathematics class at Sacremento New Technology High School. Those interpersonal skills are among 10 “learning outcomes” students here must master as they progress through all their academic subjects. The outcomes are embedded in complex projects designed to build those skills as well as course-content knowledge. “This skills set is the ticket to economic upward mobility in the new economy,” says Ken Kay, the president of the Partnership for 21st Century Skills, a Tucson, Ariz.-based coalition of business and education groups that advocates infusing such skills into education. Work Ethic Jacobsen’s grade depends not only on her mastery of algebraic concepts and applications, but also on her skill with technology, critical thinking, written and oral presentation, and whether she’s demonstrated a good work ethic on project teams with other students.